Asthma1 (see full Glossary) is a chronic condition, that may begin during a child’s early years. viral infectionslike the common cold. It is now known that a child with one parent who has asthma has a 25% (or one out of four) risk of developing asthma. If both parents have asthma, the risk increases to 50%, or one out of two. Children whose mothers smoked during pregnancy are more likely to develop asthma. Asthma may be more likely to happen also because of other factors related to pregnancy. For example, children born to very young or older mothers, children born to mothers with little care and nutrition during the pregnancy, or children who grew up in smoking environments. Children born premature or with low birth weight are also at a higher risk for asthma. 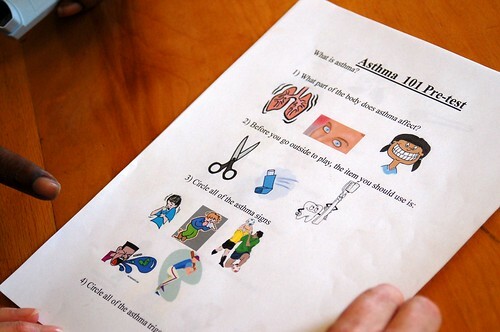 A doctor will likely make a diagnosis of asthma in a child who has repeated episodes of wheezing. This is particularly the case when family members are known to have asthma or allergies. It is important to find out the cause for asthma; this is why doctors order allergy tests. X-rays are also needed to find out the condition of the child’s airways (i.e., lungs and bronchi). Most children outgrow asthma (over 50% of children with this condition do). In some more severe cases, or for adults who smoke or live in house environments with mold and/or dust mites, the condition will persist. Most asthma attacks may be prevented by avoiding triggers. Treatment includes different medications that expand the airways used with an inhaler (Fig. 2) that are called bronchodilators and cortico steroids. Asthma flare-ups (Fig. 3) can often be prevented by avoiding whatever triggers a particular child’s attacks. Because exercise is so important for a child’s development, doctors usually encourage children to maintain physical activities, exercise, and sports participation and to use an asthma medication immediately before exercising if needed. An important treatment option for young children with asthma is physiotherapy, as respiratory exercises improve children’s quality of life. Because asthma is a long-term condition with a variety of treatments, doctors work with parents and children to make sure they understand the condition as well as possible. Parents and children are trained to use a peak flow meter (Fig. 4) on a regular basis in order to understand the level of airflow in the child. They are also taught to identify how severe an attack is, when and how to use drugs, and when to go to the emergency-room at the hospital. It is recommended that parents and doctors inform school nurses, child care providers, and others of a child’s condition and the drugs being used to treat it. Some children may be permitted to use inhalers in school by themselves as needed, and others must be supervised by the school nurse. To learn about asthma in the middle childhood years, please visit the six to 12 part of this course.